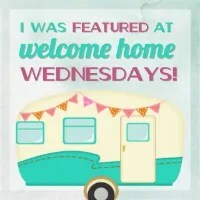 Welcome to Welcome Home Wednesdays #37!!! Wow, this week is flying by. Can you believe it’s almost my Birthday…yep, 29 again 🙂 And can you also believe we’re already planning for the end of the year party at school?? What, where does the time go?? Good thing I had time to make this yummy Chicken Enchilada Verde Soup so we had something to eat this week! Anyway, I’m super excited that it’s link party day! Woot, woot! I love seeing what you all have been up to…plus, I love reading your lovely comments. Hi Erin! Love all the great features! Thanks for hosting and have a Great Day! Thanks for stopping by, Linda! Love seeing you here! Hi Erin, yep, I counted this morning 7 weeks til end of school and yes, it’s crazy! Thanks for the party!! Crazy how fast this school year went! Thank you for partying with us! Have a great week! Hi Erin and THANK YOU for the feature! Thank you for the wonderful party! I appreciate you working so hard to share other bloggers content. I would love you to visit Thursday Favorite Things or The Recipe Sharing Party (Thursday) so I can return the favor! Have a great week. The more shares the bigger your audience! Don’t forget to comment your link #’s so I can be sure to visit. My features are chosen from those comments! Thanks for stopping by Marilyn. And thank you for being such a generous and sharing blogger. I’ll be over for the parties! Have great day! Thank you Debbie. Have a great Wednesday! Thanks for hosting – loved all the great inspirations. Thanks for linking up, Carol! See you next week! Hi Erin, Thanks for the party dear, have a nice week. Thanks for coming and partying with us, Sadhna! Hope all is well! Nice to see you! Thanks for coming by! Erin, thanks to you and the ladies for hosting! Wishing you a very happy birthday!!! Enjoy your week! Thanks, Cindy! Enjoy your week, too! Thank you so much for the feature Erin!! Of course! Your cupcakes look scrumptious!